KLIFE is a community-wide, interdenominational Christian ministry of discipleship and fellowship for youth and their families. Through a variety of activities (klubs, small group Bible studies, mission trips, and monthly events), KLIFE kids grow in their faith and have lots of fun in the process. They learn that following Christ and discovering His plan for their life is the most exciting adventure of all and that they can count on friendship and support from leaders and peers who care. One of the things that has always been unique to KLIFE is our house. 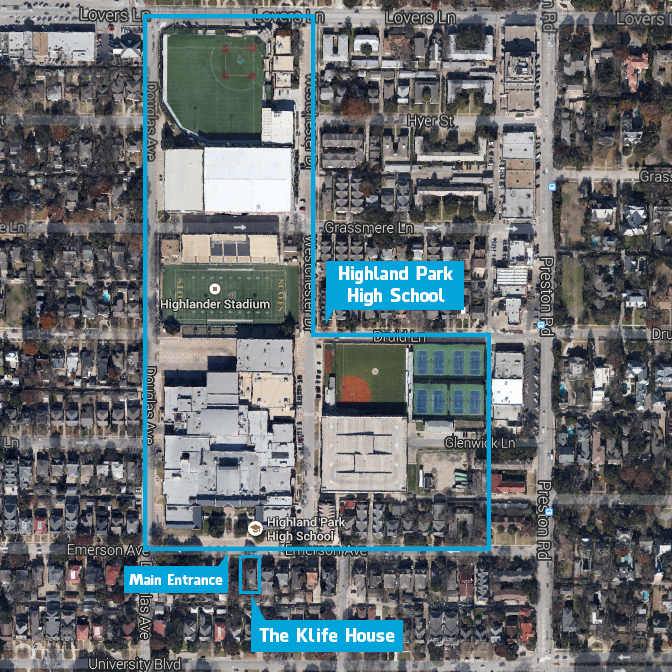 That’s because our house sits directly across the street from the front door of the Highland Park High School. This proximity has made a huge difference in providing the contact, services, and relationships for students. We’re able to have small groups before and after school, with no inconvenience for the student. And since our sports activities are all on campus, we’re able to have many functions for the students before and after events. The KLIFE Board is comprised of couples within the community looking to partner with KLIFE in its active pursuit of Christ. These couples serve to assist the ministry by faithfully praying, supporting, and assisting the ministry. Each board member is actively engaged in the ministry.